Piriformis syndrome is a diagnosis that probably gets overlooked and overused in equal proportions. It is characterized by buttock pain exacerbated with sitting and is usually associated with sciatica characterized by radiating nerve pain extending from the back of the hip down the leg towards the outer side of the ankle. However, numerous disorders can create these type of symptoms. Approximately 95% of sciatica is due to nerve root irritation in the lumbar spine. This can occur in people who do not even have much accompanying back pain. Recalcitrant sciatica usually obligates a more extensive investigation of the lumbar spine, sometimes including an MRI. Less frequently, sciatica can originate outside of the lumbar spine. For these cases, the piriformis muscle may be the culprit. The piriformis is a small muscle that exits through a notch in the back of the pelvis along with the sciatic nerve. The nerve passes underneath the muscle and courses down the back of the leg while the piriformis crosses over to attach on the back of the hip. Either from trauma or overuse problems, the muscle can compress the sciatic nerve and characteristically cause pain in the back of the hip as well as radiating sciatica symptoms. If piriformis syndrome is suspected, this can be substantiated by palpation of the piriformis from inside the pelvis where the muscle and nerve exit together through the sciatic notch. Office-based ultrasound-guided injection of the piriformis is another useful diagnostic entity that can also be used therapeutically with concomitant instillation of corticosteroid. The Piriformis exits the back of the pelvis through the Sciatic Notch along with 10 other neurovascular structures, most significant of these is the Sciatic Nerve. It lays deep to the Gluteus maximus which is the largest muscle in the body, making tenderness hard to localize. The Piriformis is an odd little muscle: It’s not very important to the hip, but its function changes depending on the position of the joint. Contraction of the muscle or stretching can worsen symptoms of Piriformis Syndrome. Symptoms are typically especially worsened by sitting, including buttock and/or sciatica radiating leg pain. Listing to the opposite side is a common position to try to alleviate symptoms. Tenderness is elicited by palpating the Piriformis over the back side of the hip. This is challenged because of the large overlying Gluteus maxiums muscle. 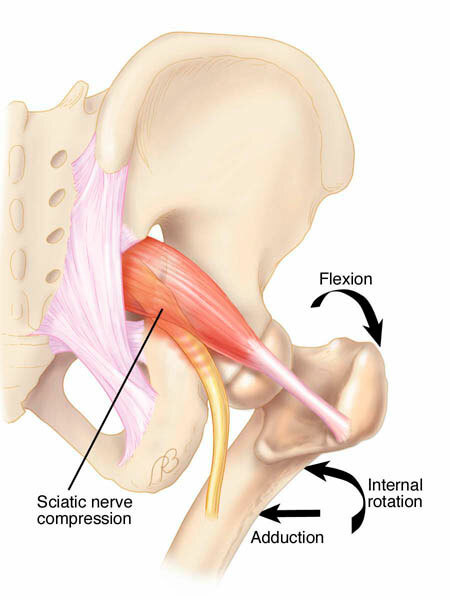 With the variable function of the Piriformis around the hip, there are numerous tests to provoke symptoms by either stretching the muscle or causing it to contract, compressing the Siatic Nerve. None are especially specific to confirm the diagnosis. Looking from the front, it can be seen where the Piriformis and Sciatic Nerve exit together from the inside of the pelvis. Pushing on this spot from inside the pelvis is the most definitive exam finding to substantiate Piriformis Syndrome. Ultrasound guided injection of anesthetic into the Piriformis is the most conclusive diagnostic test to determine the presence of Piriformis Syndrome. Concomitant injection of cortisone may have therapeutic value.